Happy Holidays! To celebrate, we've planned a brand new Family Week at the Museum of World Treasures. 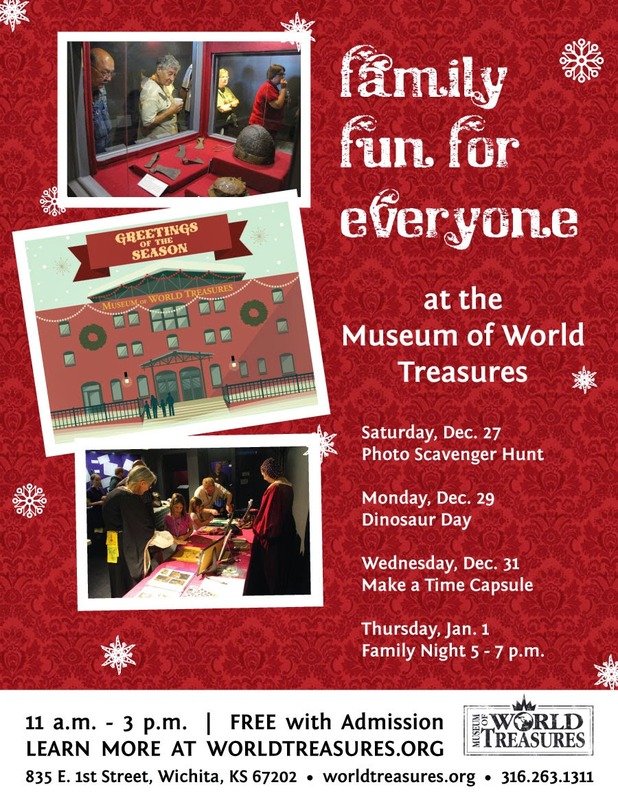 When the cookies are eaten, the presents are opened, and your family is still in town, bring them to the Museum of World Treasures for a week of fun activities and a photo contest. Saturday, Dec. 27: Photo Scavenger Hunt. Bring your family and complete a fun list of photo opportunities inside the Museum of World Treasures. Make memories with your family of all ages. Monday, Dec. 29: Dinosaur Day. Make dinosaur hats as a family and dig for fossils. Don't forget to take a family photo with Ivan the T.rex! Also bring your Pre-K children for Treasure Tales at 10 a.m.
Wednesday, Dec. 31: Make a Time Capsule. Here at the Museum, we strive to protect and save great things of the past. Save your memories in a time capsule to delight your family both now and in the future. Thursday, Jan. 1: Family Night. Visit the Museum from 5 - 7 p.m. and receive $5 (+tax) admission. Snap some photos while having fun and tag us on your social media uploads. The family who shares the best or most creative photo on Facebook, Twitter, or Instagram between Dec. 26 and Jan. 2 will win a Household Membership for 2015. Tag us on your chosen platform and use the hashtag #ivansfavfam. If you win, you will receive FREE admission to the Museum and our programs in 2015. Visit our website or call 316.263.1311 for more information about admission prices, Museum hours, or joining as a Museum Member.